Clients with dyed blond hair, whose natural colour is black or brown. In the past they could easily be identified as “false blondes” because of their prominent, dark eyebrows. Now eyebrows can be lightened up to 3 shades to match with their shade of hair colour. By using Refectocil No. 0 Blond to bleach eyebrows before tinting with No. 4 Chestnut and No. 4.1 Red you can achieve a variety of red and auburn colours, no matter what your client’s natural hair colour is. Refectocil No. 4 Chestnut and No. 4.1 Red can be used without prior bleaching for natural colours from 4N to 9N. For natural colours 1N to 3N use Refectocil No.0 Blond before tinting with No.4 Chestnut or No. 4.1 Red in order to achieve 4N or lighter, as desired. These types of eyebrows are often not able to take up the tint due to their special structure. 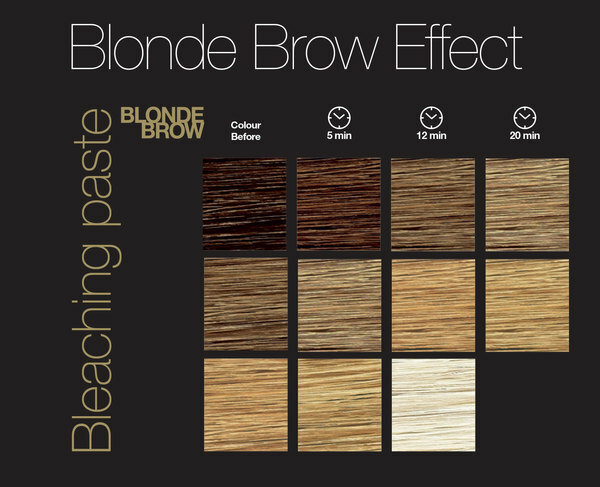 Lightening the untreated hair with Blonde Brow first, softens the hair allowing an even tint with the desired shade. Cleanse the eyebrows after the bleaching with the non-oily Refectocil Eye Make Up Remover, because eyebrows must be free of oil and dry, so that with the following application of Refectocil tint an optimum tinting result can be obtained. Important instructions for use: Mix Refectocil Bleaching paste No. 0 Blond exclusively with Refectocil Oxidant 3% Cream (not liquid!). Mixing ratio: 20-25 drops Refectocil Oxidant 3% Cream with 2 cm bleaching paste. Application time: 5-20 minutes, depending on the blonding effect desired! CAUTION: Do not mix with other colours!